Nalinika Obeyesekere, Bsc, BVSc, MSc, a veterinarian from Sri Lanka, is the first recipient of a new award for companion animal welfare developed by the World Small Animal Veterinary Association’s Animal Wellness and Welfare Committee. The World Small Animal Veterinary Association has named Nalinika Obeyesekere, Bsc, BVSc, MSc, a veterinarian from Sri Lanka, as the first recipient of a new award for companion animal welfare. The award, developed by WSAVA’s Animal Wellness and Welfare Committee (AWWC), recognizes individual veterinarians who have made a significant contribution to animal welfare and inspired others to play their part in advancing welfare globally. Dr. Obeyesekere graduated with a BSc in wildlife biology and management from the University of California Davis, and returned to Sri Lanka to work in the environmental sector. She also holds a BVSc at the University of Peradeniya in Sri Lanka and an MVSc from Murdoch University in Australia. She is now the owner-director of Pet Vet Clinic in Sri Lanka. A founding member and director of education of the Society of Companion Animal Practitioners of Sri Lanka. She has been instrumental in developing continuing education in Sri Lanka, championing higher standards of veterinary practice and adopting a one health approach. 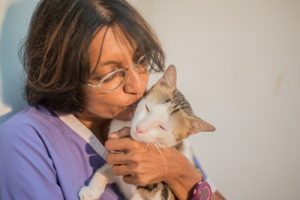 She has pioneered behavioral therapy with veterinary teams and owners, and is active on a range of veterinary and welfare focused committees, both in Sri Lanka and internationally. As founder and trustee of Blue Paw Trust, which aims to enhance human health and advance animal welfare, she is focused on eradicating rabies from Sri Lanka and leads projects to improve the relationship between the public and the country’s community dogs. Obeyesekere will receive the award during the 2018 WSAVA World Congress, which takes place Sept. 25-28 in Singapore.